Please be aware that the bathroom is about 150 feet away from the cottage and is for your exclusive use while you are here. This property was a resort in the 40's & 50's so this is a campground style bath house in the middle of the property with full shower, toilet and sink, towels, shampoo, etc. and plenty of room. Large common area with horse shoes and a fire pit. We fell in love with this charming little cottage. This particular one does not have a bathroom inside, but one available for exclusive use across a small meadow. We did not find it to be that big of a deal. 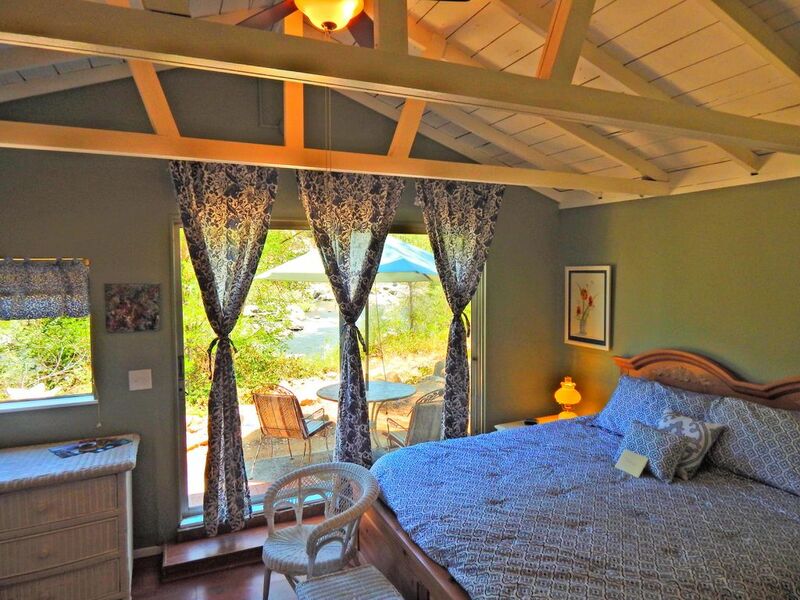 The lay out of this cottage is very open and is right on the rivers edge. A beautiful scenic backdrop for morning coffee or anytime! There is a dresser for clothing, but since there is no closer, clothing hooks would be a great addition to this little place. We were able to bring our two little dogs. They enjoyed the meadow, and we enjoyed the fact that the property was secured by fencing so we didn't have to worry about them darting into the street. It is also gated and so the only cars going in and out were other guests. The owner is a good communicator and gave us all the necessary information. She was also very accommodating and provided a loaner cell phone since our T-Mobile had no service. I hope we get an opportunity to come back again soon! This little palace is in an amazing location. The view of the river, from the room is terrific. Clearly DJ is providing a place that she would want to have provided for herself. The kitchen is stocked with plates, cookware, silverware, etc. like a home kitchen. Little extras are everywhere. We rafted the American and pulled our boats out of the water to this studio right below Troublemaker. Worked out really well to have a complete kitchen and very comfortable bed instead of camping. We will do this again! We also enjoyed great swimming right out our door. The studio is within walking distance to the gold rush sites -- a fun plus! Pets are welcome with pre-approval and $25 per pet. This property currently has 4 vacation rentals and two full time tenants. Please respect tenants privacy. We are in a high tourist location so you may hear the sounds of happy campers, rafters, weddings and the outdoor discovery school across the river through May. Quiet hours are from 10pm - 7am daily.